I read this quote today in a fantastic interview on Curvy Yoga.com about Making Friends with Your Body, and it really hit home for me. In the article, Linda Sparrowe was talking about how we can come to our yoga practice with an adversarial relationship or a mindful relationship with our bodies. I have experienced both in my yoga practice. At times it has been an amazing healing tool, which helps me to connect deeply with myself, and at other times, it has been just another way to judge my body, as I compare my curvy physique with all the lean yogis in class with me. As artists, I think we often flip back and forth in the same way. One day our art experience is blissful and the next, it is frustrating and disheartening, as we compare our work to more advanced artists and find ourselves lacking. I think I need to post this reminder over my kitchen table (which is where I do most of my art making) to remind myself that I come to my art as part of my self-expression, and self-judgement has no place there. Do you struggle some days with this as well? Is there another quote you use to help remind you to focus on the positive? I would love for you to share your thoughts on how to continue to develop your art without becoming negative about where you are now. Today's image for Texture Tuesday features Kim Klassen's beautiful new texture, Paper Love. Follow the link to see more inspiring images at Kim's site. Love the quote...we shouldn't be so hard on ourselves. I know just what you mean. Beautiful image! A lovely photo accompanied by a heartfelt quote. Too many times we're too hard on ourselves when all we need is a little TLC. Joyelle, your image is beautiful and thoughtful . . . I just read another great quote about judging ourselves..."Don't compare your beginning to someone else's middle." 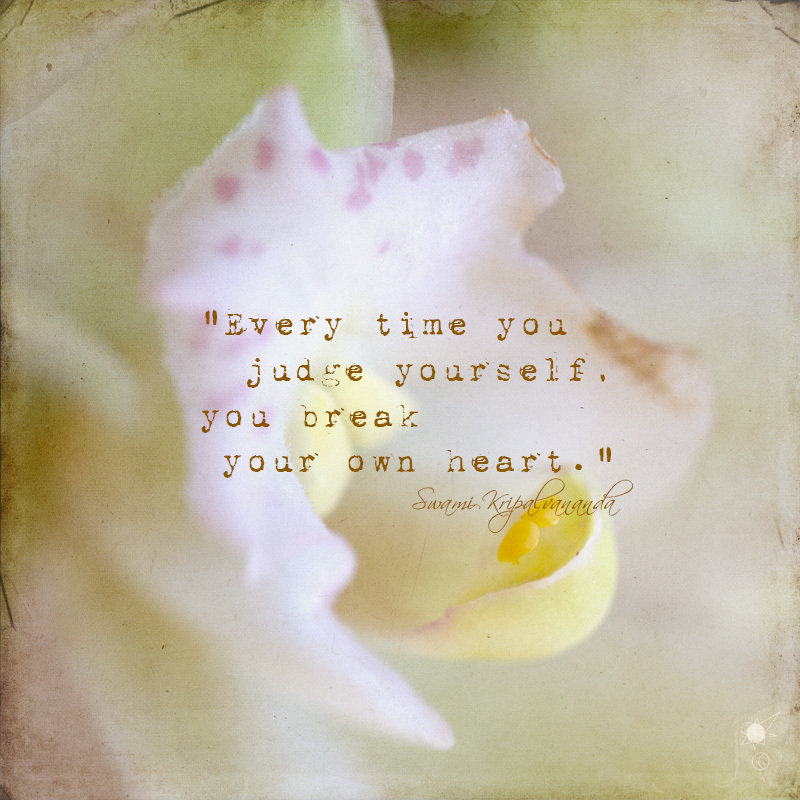 Thought that was rather "right-on" when it comes to judging ourselves too severely. Beautiful image and lovely post!! I love this quote, and this post. I think self-judgment is one of the biggest dragons we all face in life. It's an easy trap to fall into, and I do, often. In an interview with Marcy Axness she said that it's easier to feel the guilt than the pain, sometimes. I think the same could be said for judging - it's often easier to judge ourselves than to open ourselves up and be vulnerable.